What a delight! I came to Web of Stories to listen to the stories of famous scientists, and was well-rewarded with hours of engrossing talk. Only after I'd been through the lives of a dozen scientists did I decide to try some other people and lucked into Diana Athill first go. Clever, warm, and highly articulate, she kept me up half the night; never bored, though I had not heard of many of the people she speaks of, and had barely heard of her. Now I'll head to my library site to find her memoir, which is bound to be worth reading. The whole of my family were completely bookish. They were academics, a lot of them. My great-grandfather was the Master of University College at Oxford and so everybody was always reading. And we were never given anything for Christmas, which was rather a matter of disappointment, really. We were always given books. I do remember once being given a lovely grey elephant, which I liked very much, and my brother had a fort. But mostly, we got books. And the ones that were clearly improving, one didn't read, but the others, one read avidly. And one sort of went on without realising it from children's books to more grown-up books because everybody was reading in the house. I mean, there were just books, books, books, books. In my grandparents' house, there were books in the library, there were books in all of the rooms. There were books… there was a huge shelf of books in the nursery, up to the ceiling. There was an enormous, long passage called The Corridor, which had books from floor to ceiling, which was a lovely passage because it was rather dark and you never knew what you were going to fish out. And it might be a handbook on veterinary work or it might be Barron Resources. I remember that is where I found The Scarlet Pimpernel, in that passage. So there they all were, all the time and one took it for granted that they were very desirable. I mean, my father was absolutely mad on PG Wodehouse, and so when the new PG Wodehouse came out, it was a sort of excitement in the house. And he, of course, had to have it first, and one almost wanted to murder him, one wanted to get to it so quickly. And therefore, it simply was natural. 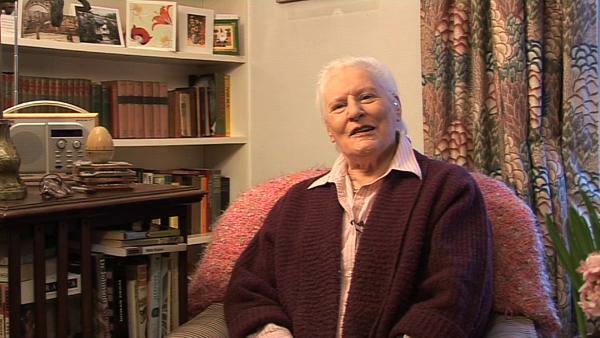 Diana Athill (1917-2019) was a British literary editor whose publishing career began when she helped André Deutsch establish his company. She worked with many notable writers, namely Philip Roth, Simone de Beauvoir, Jean Rhys and VS Naipaul. Following the publication of her memoirs, she came to be hailed as an author in her own right. Christopher Sykes is a London-based television producer and director who has made a number of documentary films for BBC TV, Channel 4 and PBS.